I chanced upon Zaw Htay (name changed) looking longingly at a bottle of Johnny Walker Black Label whisky at the Junction Mall in Myanmar's administrative capital. Htay, a citizen of Myanmar, works in Malaysia and was home for holidays. He was on his way back to his hotel. Why a hotel? "That is the rule," he said. "If you are returning from abroad, you have to stay in a hotel for the first two days. They do not want you to get into any discussions." What he means is, the military authorities need to monitor what he's doing, coming as he is from a foreign environment. The two-day hotel stay is the cooling-off period. Theoretically -- and not always in theory -- if a person goes to spend a night in his brother's house, he has to inform the local police station. If he is going out of town, he has to inform the police station. If he has to have surgery, he has to inform the local police station...and so on. There is a fairly primitive but effective reporting system in place. An individual in a locality is appointed the 'leader'. He files reports to the police every evening about the activities in his area. These could be as innocuous as who cooked fish noodle soup for breakfast that morning. 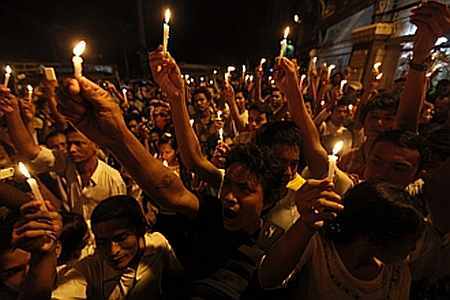 Or, it could be valuable information about plans for a demonstration against power shortages, of the sort that Yangon and Mandalay saw a few days earlier. Now that democracy is creeping up on Myanmar, there are palpable changes. 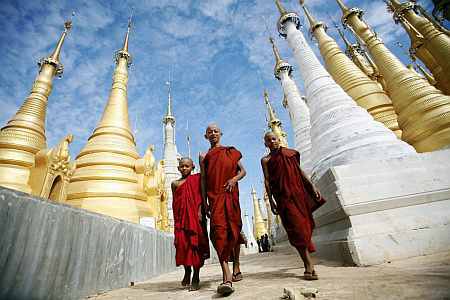 "Sixty five per cent of Myanmar is dependent on agriculture. We grow mostly paddy. Most of the land is owned by the state and you give a share of what you grow to the government, keeping the rest for your own consumption. But now, things are changing. Because the sanctions have been lifted, we will now have the chance to export our rice. This means the government has to buy much more rice from farmers. So, recently, they set up a merchants' committee that will fix a price at which the government will procure paddy from farmers." an interpreter explained. Worrying, he added, because "it could mean that in the future, our people will have less to eat". Is the committee headed by a merchant – because they're the ones who know the markets best ? "No, of course not," he said pityingly. "It is a retired Army officer. It is always the Army, everywhere. But, wait till 2015" he promised. 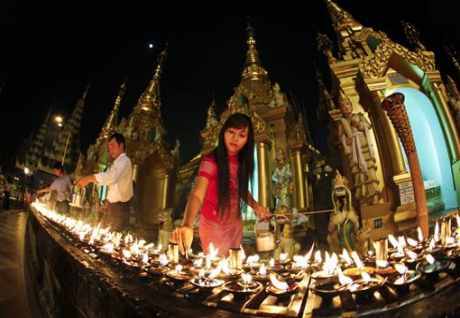 The year 2015 is Myanmar's tryst with somewhat real democracy. Currently, the Army is insulated from all reprisal. Its officers cannot be tried in civilian courts, only in military tribunals; officers get all manner of perks; and countries that are smart, like China, set up industry with military equipment as an ancillary. That is the surest way of ensuring you get a contract. So, when Northern Industries of China took over the Monywa copper mines in Myanmar recently, it hawked small arms from its own factory at 'friendship prices' to help the Myanmarese Army tackle insurgency. 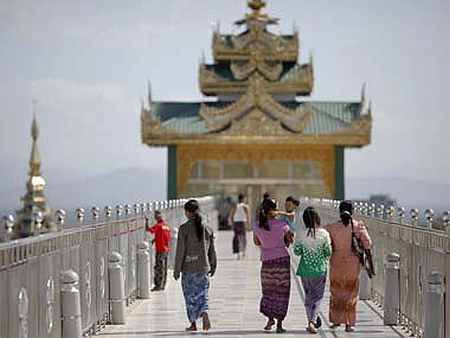 The structure of Myanmar's society and economy helps manage a guided democracy. There is only a miniscule middle class, occupied almost entirely by the Army. A Colonel in the Army is paid an equivalent of Rs 20,000 a month, with perks. The salary of a professor is the equivalent of about $100. The cost of living is double any small city in India. The rest of the country is desperately poor. However, while there is poverty, there is no hunger. Of course, there are the very wealthy, likely to get wealthier still by the lifting of sanctions. You cannot do any business in Myanmar without a local partner. In the past three months, businessmen have been flocking to Yangon to set up deals. "Serviced apartment rates have trebled in the last six months. Hotel rack rates have doubled. Every month, the government sets a new record for tourist inflows, there are so many people coming here" said an Indian embassy official. 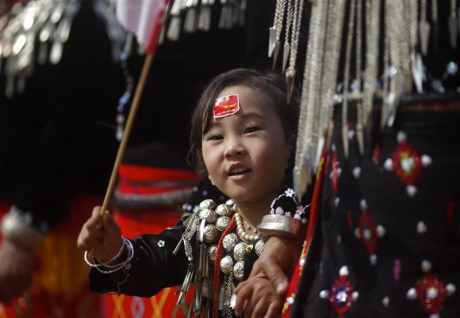 Myanmar's lightening up is visible in the most unexpected places. Not surprisingly, youngsters are spending like crazy -- on video games, on toys, clothes. But in shopping malls, the most crowded areas are the internet cafes -- despite the video cameras set up by orders from the Army that record everyone who is coming in and going out; despite the log that every owner has to maintain to record the sites visited. The New Light of Myanmar (NLM) is the only daily newspaper in the country. The weekly Myanmar Times comes out only sporadically after its owner, an Australian, wrote reports mildly critical of the government and was escorted into jail on charges of molesting a woman in a bar. NLM writes editorials about corruption in the Army and the shortage of power occasionally -- but is careful not to name or criticise individuals. Cautious about democracy, Myanmar is just dipping its toe into the waters to test it. But its people have tasted blood.